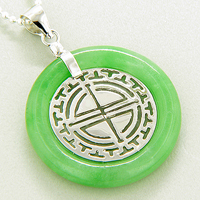 This Silver Pendant comes as GREEN JADE Circle Donut with SILVER Labyrinth Symbol inside. This makes the Pendant to be Extremely Lucky in showing right way in tough and unpredictable situations. Very SPECIAL Outlook and Eye Catching Design.